★ Safety driving - Keep your cell phone in sight at eye level and ready for GPS directions and hands-free calls. 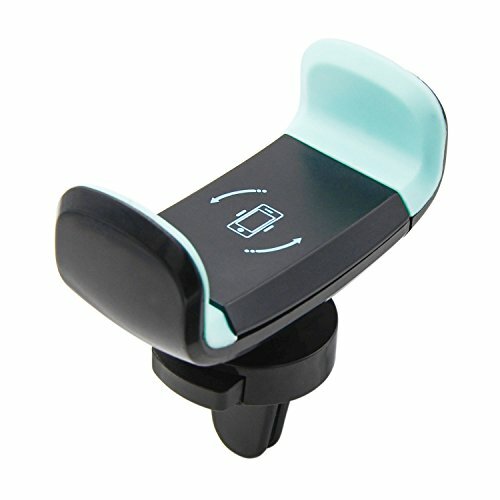 ★ Convenience: The car mount holder adopts push-In design achieves One-Hand Operation, which is more convenient and safer while driving. ★ Universal Fit: It can reach 3.56 inch width after fully expanded, securely holds mobile phone up to a 5.5\" screen such as iPhone 5 and 6s Plus. Full 360 degree Rotation helps to change the viewing angle with no hassle, horizontal, vertical, and angled all be fine. ★ Convenient and Secure: The adjustable rubber claws, easy to install and remove. The touch surface is soft and will not scratch your devices and vent. ★ Steady&Durable: High quality materials ABS and PVC, it is sturdy and anti-skid. Keep your devices on it and non-slip, even when you are driving on a bumpy road.